Count the number of events by category (to add grouping in a view, right-click in the tables area at the top of view view and choose Add Group By). Your view should list the number of events for each category. Save this view as EventsByCategory (you'll need to accept the change suggested about adding a TOP 100 PERCENT clause). 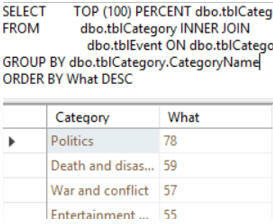 Choose to alter your view in a new query window. This SQL should return just 4 rows. Save your script as A nice view, then close it down.